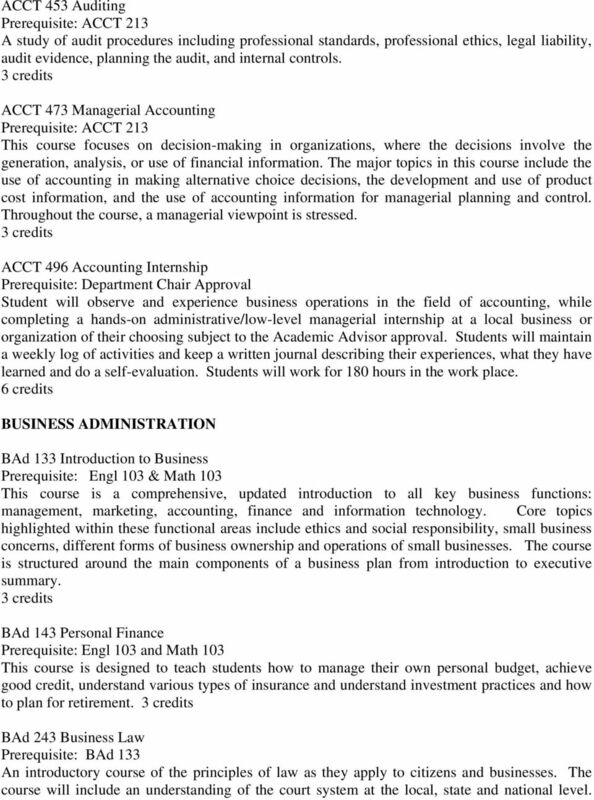 Download "BUSINESS COURSE DESCRIPTIONS ACCOUNTING"
1 BUSINESS COURSE DESCRIPTIONS ACCOUNTING ACCT 103 Principles of Accounting I.I Prerequisite: Math 103 & MIS 113 An introduction to accounting where emphasis will be placed on the accounting cycle and double-entry accounting. 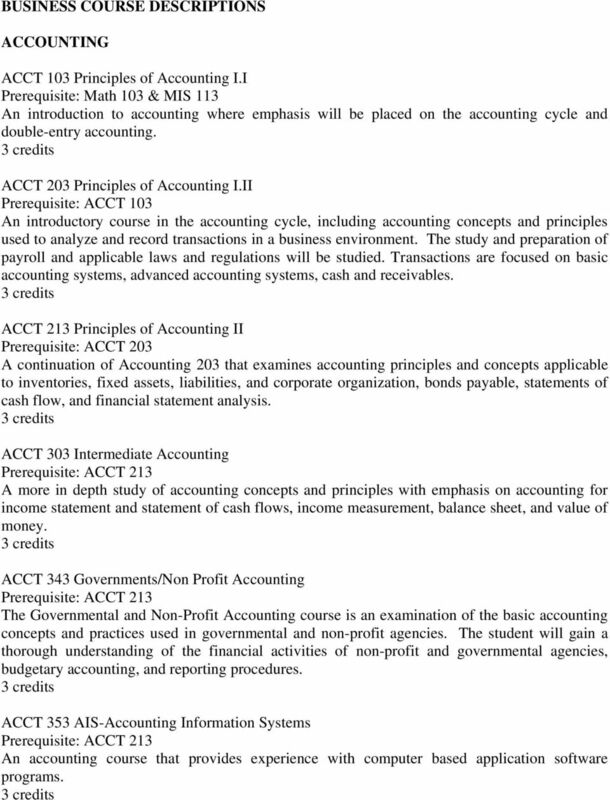 ACCT 203 Principles of Accounting I.II Prerequisite: ACCT 103 An introductory course in the accounting cycle, including accounting concepts and principles used to analyze and record transactions in a business environment. The study and preparation of payroll and applicable laws and regulations will be studied. Transactions are focused on basic accounting systems, advanced accounting systems, cash and receivables. ACCT 213 Principles of Accounting II Prerequisite: ACCT 203 A continuation of Accounting 203 that examines accounting principles and concepts applicable to inventories, fixed assets, liabilities, and corporate organization, bonds payable, statements of cash flow, and financial statement analysis. ACCT 303 Intermediate Accounting A more in depth study of accounting concepts and principles with emphasis on accounting for income statement and statement of cash flows, income measurement, balance sheet, and value of money. ACCT 343 Governments/Non Profit Accounting The Governmental and Non-Profit Accounting course is an examination of the basic accounting concepts and practices used in governmental and non-profit agencies. The student will gain a thorough understanding of the financial activities of non-profit and governmental agencies, budgetary accounting, and reporting procedures. ACCT 353 AIS-Accounting Information Systems An accounting course that provides experience with computer based application software programs. 2 ACCT 453 Auditing A study of audit procedures including professional standards, professional ethics, legal liability, audit evidence, planning the audit, and internal controls. ACCT 473 Managerial Accounting This course focuses on decision-making in organizations, where the decisions involve the generation, analysis, or use of financial information. The major topics in this course include the use of accounting in making alternative choice decisions, the development and use of product cost information, and the use of accounting information for managerial planning and control. Throughout the course, a managerial viewpoint is stressed. ACCT 496 Accounting Internship Prerequisite: Department Chair Approval Student will observe and experience business operations in the field of accounting, while completing a hands-on administrative/low-level managerial internship at a local business or organization of their choosing subject to the Academic Advisor approval. Students will maintain a weekly log of activities and keep a written journal describing their experiences, what they have learned and do a self-evaluation. Students will work for 180 hours in the work place. 6 credits BUSINESS ADMINISTRATION BAd 133 Introduction to Business Prerequisite: Engl 103 & Math 103 This course is a comprehensive, updated introduction to all key business functions: management, marketing, accounting, finance and information technology. Core topics highlighted within these functional areas include ethics and social responsibility, small business concerns, different forms of business ownership and operations of small businesses. The course is structured around the main components of a business plan from introduction to executive summary. BAd 143 Personal Finance Prerequisite: Engl 103 and Math 103 This course is designed to teach students how to manage their own personal budget, achieve good credit, understand various types of insurance and understand investment practices and how to plan for retirement. BAd 243 Business Law Prerequisite: BAd 133 An introductory course of the principles of law as they apply to citizens and businesses. The course will include an understanding of the court system at the local, state and national level. 5 Prerequisites: BAd 343 Important issues and problems in business today are reviewed during the first-half of the semester, students then proceed to guided independent research in an area of personal interest to them, culminating in the writing and presentation of a significant Research Paper on the selected business issue. 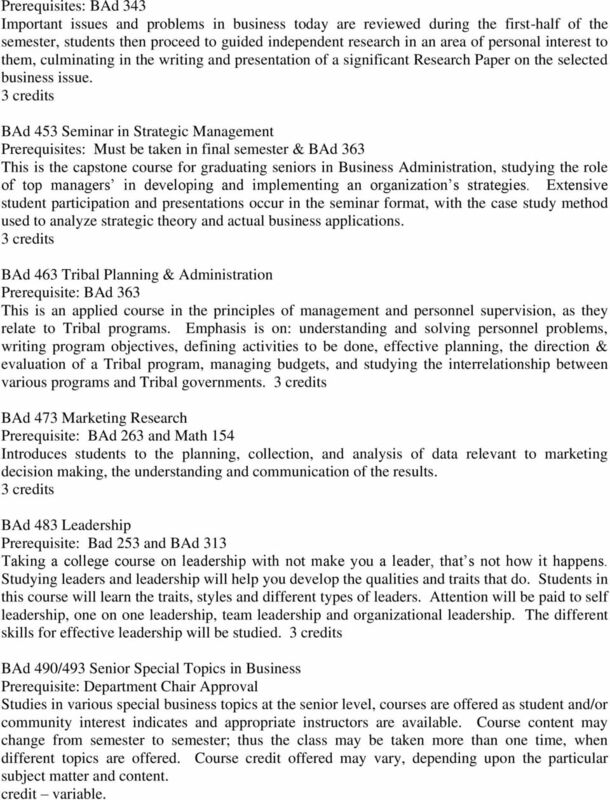 BAd 453 Seminar in Strategic Management Prerequisites: Must be taken in final semester & BAd 363 This is the capstone course for graduating seniors in Business Administration, studying the role of top managers in developing and implementing an organization s strategies. Extensive student participation and presentations occur in the seminar format, with the case study method used to analyze strategic theory and actual business applications. BAd 463 Tribal Planning & Administration Prerequisite: BAd 363 This is an applied course in the principles of management and personnel supervision, as they relate to Tribal programs. Emphasis is on: understanding and solving personnel problems, writing program objectives, defining activities to be done, effective planning, the direction & evaluation of a Tribal program, managing budgets, and studying the interrelationship between various programs and Tribal governments. 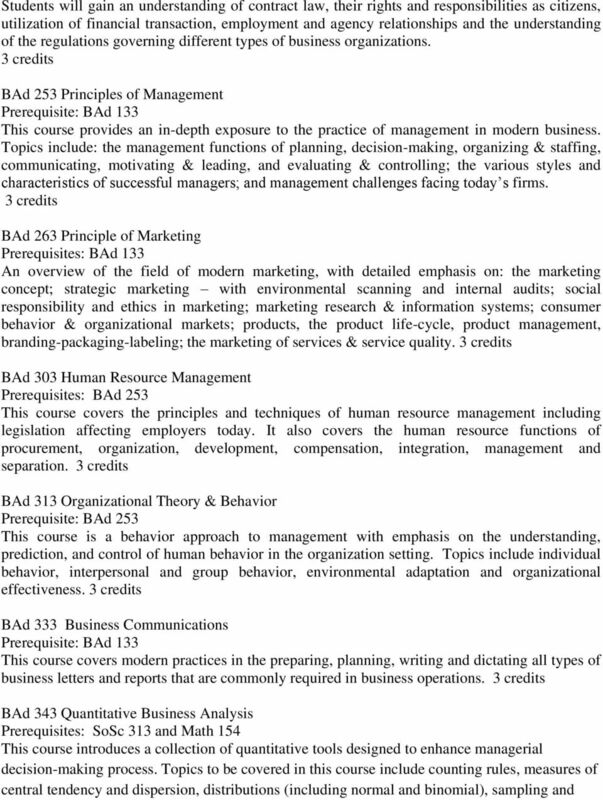 BAd 473 Marketing Research Prerequisite: BAd 263 and Math 154 Introduces students to the planning, collection, and analysis of data relevant to marketing decision making, the understanding and communication of the results. BAd 483 Leadership Prerequisite: Bad 253 and BAd 313 Taking a college course on leadership with not make you a leader, that s not how it happens. Studying leaders and leadership will help you develop the qualities and traits that do. Students in this course will learn the traits, styles and different types of leaders. Attention will be paid to self leadership, one on one leadership, team leadership and organizational leadership. The different skills for effective leadership will be studied. 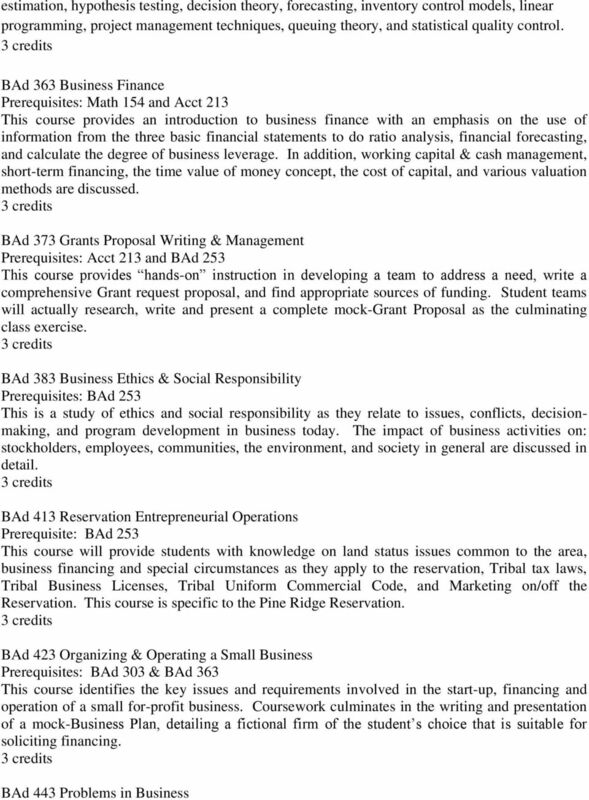 BAd 490/493 Senior Special Topics in Business Prerequisite: Department Chair Approval Studies in various special business topics at the senior level, courses are offered as student and/or community interest indicates and appropriate instructors are available. Course content may change from semester to semester; thus the class may be taken more than one time, when different topics are offered. Course credit offered may vary, depending upon the particular subject matter and content. credit variable. 6 BAd 496 Business Internship Prerequisite: Department Chair Approval Student will observe and experience business operations in a variety of functional areas, while completing a hands-on administrative/low-level managerial internship at a local business or organization of their choosing subject to the Academic Advisor approval. Students will maintain a weekly log of activities and keep a written journal describing their experiences, what they have learned and do a self-evaluation. Students will work for 180 hours in the work place. 6 credits ECONOMICS Econ 203 Principles of Microeconomics Prerequisite: Math 103 This course is designed to give students an understanding of basic economic concepts, such as: supply and demand, the operation of the price mechanism, substitute goods, economic trade-offs and opportunity cost, which affect the activities of businesses and consumers in a capitalist market economy. Emphasis is also given to the Mixed Economy, and how the student becomes part of it on, or off, the reservation. Econ 213 Principles of Macroeconomics Prerequisite: Econ 203 This course is designed to give students an introduction to the principles underlying economic processes, such as: the nature of the free enterprise system; income & consumptive spending; the money & banking systems; national output, income and the gross national product; monetary & fiscal policy; and unemployment & inflation as they relate to governmental decision-making and the national accounts. 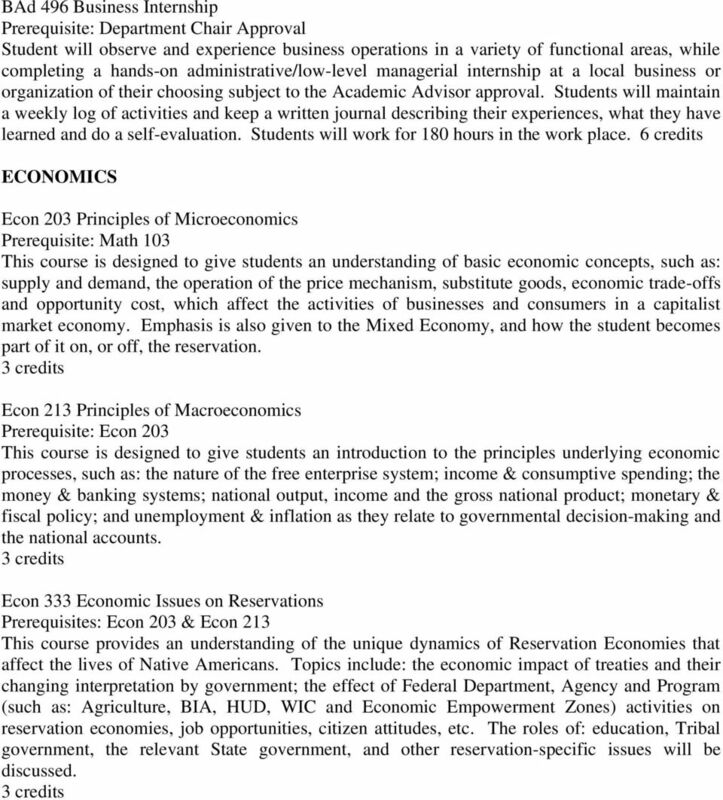 Econ 333 Economic Issues on Reservations Prerequisites: Econ 203 & Econ 213 This course provides an understanding of the unique dynamics of Reservation Economies that affect the lives of Native Americans. Topics include: the economic impact of treaties and their changing interpretation by government; the effect of Federal Department, Agency and Program (such as: Agriculture, BIA, HUD, WIC and Economic Empowerment Zones) activities on reservation economies, job opportunities, citizen attitudes, etc. The roles of: education, Tribal government, the relevant State government, and other reservation-specific issues will be discussed. UNIVERSITY OF SOUTH ALABAMA MANAGEMENT 1 Management MGT 300 Management Theory and Practice 3 cr Theories of organizational structures, practices, and behavior, and the effective management of organizations. Master in Business Administration The M.B.A. program at Silliman is rooted in the principle of Christian stewardship and the husbanding of God s resources towards the fulfillment of a just and humane society.